4.0.1 Investing in Dubai Gold – How To Do it Right? 4.0.2 Is Dubai Gold a Safe Haven? Todays gold rates in Dubai are: 10K: 62.83 AED, 11K: 69.11 AED, 12K: 75.40 AED, 14K: 87.96 AED, 18K: 119.50 AED, 21K: 139.25 AED, 22K: 146.00 AED, 24K: 155.50 AED, Ounce: 4.700,39 AED. (This prices are quoted in AED; United Arab Emirates Dirham for one gram of gold). The rates are updated twice a day: 10AM and 18PM ECT based on facts from LBMA. Rates were last updated 31.1.2019 2.55 GMT. The current prices for one gram of gold in Dubai and UAE are published by the Dubai Gold & Jewellery Group, who is a member of the London Bullion Market Association(LBMA) – the world’s authority for precious metal markets. They update the prices twice a day (opening and closing) using three major currencies: Euros (EUR), British Pounds (GBP) and US Dollars (USD). We provide you with the current rates for 24, 22, 21, 18, 14, and 12 carat gold in 6 major currencies: AED, USD, EUR, CNY, GBP, INR gathered from the world most accurate exchanges. 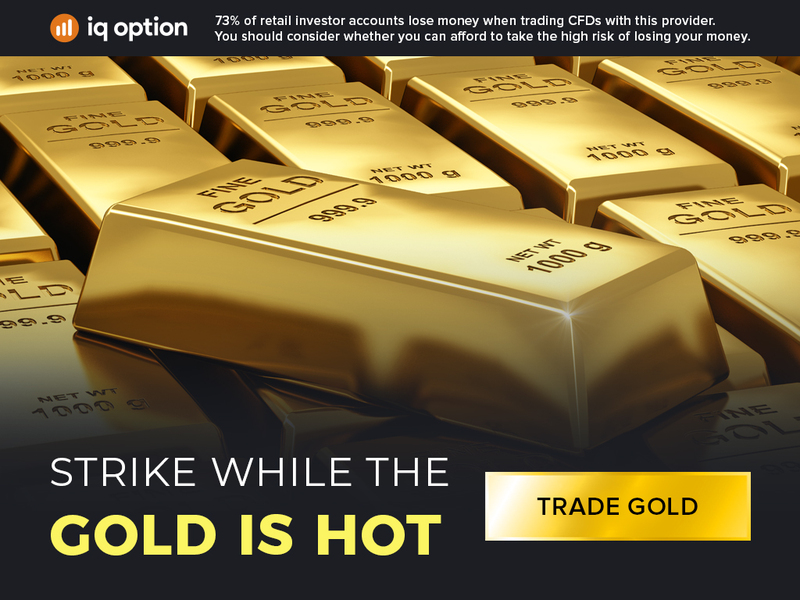 Gold rates are the prices you need to pay for one gram of gold defined by the international stock markets twice per day. When it comes to assessing and understanding the online price of gold by different suppliers, it’s important to remember that this precious metal is a commonly traded substance with an internationally set price. There’s a benchmark price set in London, and that price is used as a guide to help direct the trading decisions made around the world. The price for gold established in London is set by a group known as the London Bullion Market Association, or LMBA. These people participate in a selection of carefully-chosen electronic auctions to establish the correct price. Every business day, two auctions are held, with one at the morning at 10:30 am, and the other in the afternoon at 3 pm GMT. The price is quoted in dollars (US) for the total of a troy ounce of pure gold. Once the price of pure gold has been established, the LMBA can come up with corresponding prices for different types of this metal with lower purity. As mentioned above, the LMBA price refers to the worth or value of gold for a troy ounce of pure gold. On the other hand, the Dubai retail rate given at this time is for a single gram. There are approximately 31 grams in a troy ounce. Or, to give a more precise number, 31.1034768 grams. The gold price in Dubai and the price given by the LMBA often differ. This is because the numbers provided by the LMBA are only intended as a benchmark, and the Dubai trading block is also ahead of the London community too. When Dubai opens for business, the price will be a day behind from LMBA. The Dubai rate is also quoted at retail rates, which means that a small premium must be included to cover charges for customs and delivery charges. There’s also a margin in the price that protects sellers from fluctuations in price. Now that you know the basics of gold prices Dubai for bullion and retail gold, you might be interested in hearing more about the prices of jewellery. 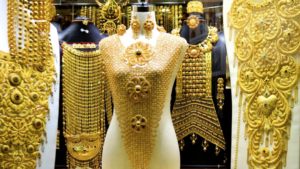 The price of an item of jewellery purchased in Dubai will be made up of both the price – which is the cost of the gold used in the item and the making charge. A making charge is an additional cost added by the retailer to cover the costs associated with producing the item of jewellery. This charge ensures that the designer of the jewellery makes a profit on their time. In many of the stores and outlets that sell jewellery around Dubai, it’s possible to haggle over the price of a piece. However, it’s worth noting that the seller can only adjust the making charge of the price. No retailer will sell a piece of gold for less than it’s current worth according to the retail price. Of course, if you’re willing to pay for an item in cash, then some creators may drop their prices slightly. Despite the high quality of gold available in Dubai and UAE, the making charge margins in this country can be quite low compared to some of the other regions in the world. There’s no sales tax or VAT to pay in Dubai or UAE, which can lead to quite a saving. In fact, you could get it for much cheaper in Dubai than you would be able to get it anywhere else. Investing in Dubai Gold – How To Do it Right? To evaluate some of the aspects of investing in this precious metal, let’s compare its performance with the S&P 500. To elaborate, the S&P is an American stock market index that corresponds to a combined market cap of the 500 largest companies that have their stocks listed on NASDAQ or NYSE. Gold has underperformed in the last 10 years when compared with the S&P 500. Investing in it has generated around 3.3% while the S&P 500 has managed to return more than 10% in the same time period. However, if we look to another 10 year period, between from November 2002 to October 2012, we see a completely different picture. In that time, it has appreciated by a whopping 441 % while the S&P 500 grew by 58%. That shows us, that it is not always a good investment option. The best time to invest in any asset is at the time of doubt and negative sentiment as the asset is cheap, meaning there is a greater upside potential when the market sentiments change. There are many perks and drawbacks when investing in any asset. If you don’t like having this precious metal in physical form, you can get some shares in a mining company as an alternative. If you think that it is a good hedge against inflation, you would probably buy it in coins, bullion or other forms. And if you prefer to be using leverage to earn some larger profits on the volatility of the price, you should turn your attention to the futures market. Remember, however, that future trading is among the riskier investment options. 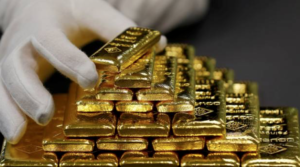 Is Dubai Gold a Safe Haven? Whether we are talking about conflicts in the Middle East, Asia or somewhere else, it is becoming apparent that we are currently in times of political and economic uncertainty. There are many investors who turn to this precious metal as a safe haven during the times of uncertainty. It is a good choice in that regard since it historically held its price in events of war or economic stagnation. Therefore, a lot of investors turn to that precious metal when there is news of global economic or political unrest. Generally, gold is considered a diversifying investment. Throughout different periods in time, it was always seen as such. Whether you want to protect yourself from inflation or hedge against your other assets in stocks or bonds, you should turn to gold. Since it is not correlated to real-estate, stocks or bonds, that logic makes perfect sense. Gold stocks are mostly more popular among growth investors as opposed to income investors. Even though this stocks generally rise and fall in line with the movement of gold prices, there are some mining companies that manage to turn in profit even when the price is down. Profits generated by this stocks are usually larger than the price hike of physical shapes. A small increase in the price can often result in a significant rise in stock prices. Therefore the owners of this stocks usually get a higher return on investment in comparison to physical shape owners. This stocks with a good track record in terms of dividend yields can be an appealing choice even for investors who are primarily focused on growth rather than regular income. Stocks that pay dividends are often generating higher gains in times of the rising prices while faring better than non-dividend-paying stocks in the times of a downturn of the price index.